When Michael Franti made the decision for the new Spearhead album to include the legendary reggae rhythm section Sly & Robbie as producers, the duo invited him to head to Jamaica for the sessions. Franti was excited by the prospect of what those veterans could add to the record, but had no idea that the general Jamaican population would play a part as well. "It's a unique experience being down there because the studio door is always open, so people can just come in off the street and start listening to music and commenting on the songs, and you see immediately if they like the beat or not," said Franti, speaking from Raleigh, NC. "They'll even offer you advice, say, 'Hey man, I think in the second verse you need a new keyboard part.' You're looking at this guy you've never seen before: 'Who the hell are you?' And then you realize, damn, they're right! I do need a new keyboard part." 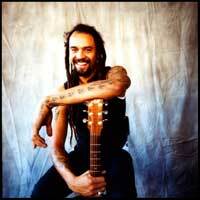 The music of Michael Franti and Spearhead has incorporated various elements into their albums over roughly the past fifteen years, including hip-hop, funk and folk. Franti's love for reggae is at the fore with their new album, "All Rebel Rockers," and while the band's social consciousness is present in these lyrics, Franti sees value in looking at the broader picture to deliver an effective message. "There's always a social thread going through my music," said Franti, "but I find that the songs that reach people the most are the ones that are more universal, that can be applied to a lot of different things: anywhere from a personal conflict to a world political conflict. "But usually when I write it's not because I'm saying, okay, I've got to write a song about this issue or that. It's because I wake up that day and I just go, 'I've got a great idea for a song.'" After his late-Eighties work with the punk-driven Beatnigs and the hip-hop platform of Disposable Heroes of Hiphoprisy in the early Nineties, Franti formed Spearhead in 1994 and kicked off their series of albums with that year's "Home." (Label issues later prompted a change to the band's moniker, with Franti's name attached.) Over the years their reputation for focusing on socio-policial issues has spurred a growing following, but their new "All Rebel Rockers" and its reggae-driven universal themes could have a broader appeal similar to Bob Marley's best-loved music. Politically, Franti and Spearhead have always been geared toward offering thought-provoking lyrics in their songs without feeling the need to invoke specific names. The band was invited by the Obama campaign to perform at the inauguration, though it is still important to Franti to leave political decisions in the hands of his fans. "Over the past year we had made a lot of connections with the folks in the Obama campaign, and so there were some people in the campaign who had invited us to come out there and be part of that. "During the lead-up to the election I never endorsed Obama. I've never endorsed any political candidate. I've always endorsed political ideas, but I've always felt, as an artist, I want my fans to be the best-informed they can be and make their best decision from their own mind and heart."